Buildings of all ages can be affected by Dry Rot and Wet Rot. This fungal decay is found in timber which has been wet for some time. As well as having the fungal decay treated it is essential that the source of dampness is located and eradicated. Dry Rot is the most serious form of fungal decay in a building. The decay is caused by a certain species of fungi that digests parts of the wood which gives the wood strength and stiffness. It has the ability to pass through inert material to spread to other timbers. The mature fruiting bodies of wood-destroying fungi that develop during an attack produce millions of microscopic spores and these are widely dispersed by air currents. Falling on untreated timber they will germinate to form a mass of hyphal threads called mycelium. Dry Rot affects timbers which are exposed to damp conditions and where there is a general lack of ventilation. Externally exposed timber, timber in contact with wet soil or masonry, or timber subject to a damp atmosphere can all suffer from fungal attack. Typical indications of dry rot being present include shrinking, darkening and cuboidal cracks appearing in the timber. Under humid conditions a white fluffy ‘cotton wool’ mycelium develops. Under less humid conditions, a grey/mushroom coloured skin with patches of yellow often develops. Fruiting bodies are soft, fleshy pancakes with a centre which is a yellow ochre colour when young, darkening to a dark orange – rusty red colour surface. Rust red coloured spore dust are frequently seen around fruiting bodies. The active decay often produces a musty, damp odour. Wet rot is more common but is less serious. Wet Rot comes in two forms, Brown Rots and White Rots, both of which are destructive to timber. Generally brown rots cause cuboidal cracking and shrinking of the timber whilst white rots tend to reduce the timber to a stringy, fibrous texture. The decay of the timber is typically confined to the area where it has become and remains wet. The high moisture content allows the fungus to establish and develop. Typical causes are gutter leaks, roofing defects, plumbing leaks etc. 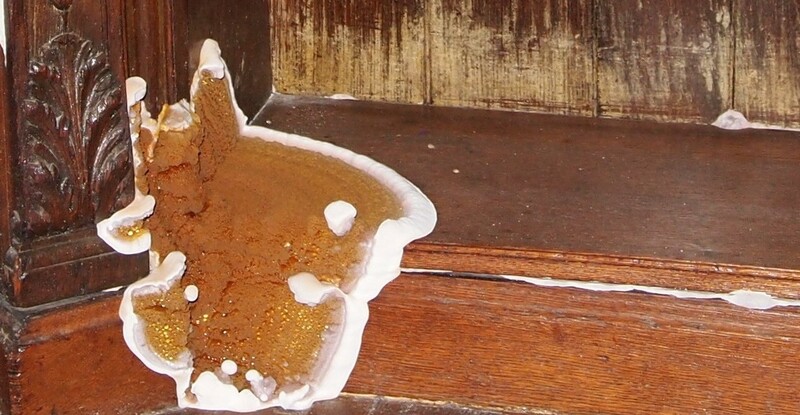 Damp, poorly ventilated environments are susceptible to outbreaks of wet rot. Contact us today to book a survey and one of our CSRT (Certified Surveyor in Remedial Treatments) qualified surveyors will provide a report identifying the type of fungal infestation that is present, as well as a quotation for the necessary treatments.